There is no doubt I have one of the largest, greatest balconies in my apartment complex overlooking the pool. As my friend Allison, would say “This is what you pay a premium for – to have what amounts to an entire extra room with a great view”. I have a table and chairs, 2 outdoor lounges and footrests, flowers, herbs, a decent size bar and a BBQ. For any self-respecting Aussie, this would normally mean a charcoal weber and probably a gas grill as well – we believe you’ve got to have options! However in nearly every place in New York there is a strange phenomenon – you MUST have an electric grill (it’s safer they say), no gas, no charcoal allowed. Many times I’ve had this discussion with home-owners and apartment dwellers alike. How is it safer I ask? “Well, a gas grill could explode and catch fire” they tell me. When did this last happen I ask? “Well I can’t remember, but you know it’s America, it’s a liability and someone could sue etc” they tell me. This leads me to explain how I lived in Australia, in Melbourne CBD on the 13th floor of a high-rise apartment building with both charcoal & gas grills on my balcony (as did all my neighbors) for years. None of us ever demolished the building with a fire or wiped out the casino opposite with flying sparks etc. “Amazing” they say with big round eyes while thinking “any day now a building will go up in flames and wipe out the city of Melbourne and it’ll be on CNN”. So, when I moved into my first apartment last year, I gave my gas BBQ to a family that didn’t have one. This would be unheard of in Australia – not having one I mean. I bought my first electric grill in a state of mild terror assuming the end of my happiness. Behold the weber Q electric grill! So it grills well (not the same as gas/charcoal) but I did not give up on barbecues as a result (which was my fear). In fact I’ve become really adept at this electric grill thing and it works really well. Meat is juicy and gets a smoky flavor since you have to grill with the lid closed. I even treated some locals to grilled peaches with honey, crushed nuts and cream or rum soaked pineapple with brown sugar and coconut ice-cream! Grilling fruit for dessert is a novelty here. Lulled into a false sense of security I was happy, “was” being the operative word until last night’s grill fire. All these “it’s safer” warnings rang in my head as my friend and I decided what to do about the ensuing fire. I always pre-heat my grill, the problem started when I opened the lid and brushed the grill off as it was getting hot. I saw something small drop down between the grate and closed the lid as it still needed more heating time. The next thing you know our margarita time is interrupted as we notice the orange flames and smoke billowing (safer they said). I took a quick look under the lid and the flames got way bigger – this can’t be good I think. My friend, slightly alarmed, suggested an extinguisher but given I didn’t have one that was not an option. Although, she did offer to run out and purchase one or ask if they had one downstairs. So after some, quite frankly, ingenious work to pull the electric plug out, and close off the air to stop the flames – it died out after about 15 mins. Thank you to Dad who taught me how to manage these small crises – no air, no flames and understanding electrical fires are different to grease fires etc – though this turned out to be neither. After more margaritas, and some reflection, I did mention that we missed the perfect opportunity to call the fire dept. We could have had them carry us down a ladder off the balcony, perhaps I’ve got far too attached to that Chicago Fire show. This morning the grill was an absolute mess. So, let me be clear, this was in no way a Weber manufacturing or electrical issue. Just in case you’re wondering, I took off to the wilds of New Jersey and bought the exact same model today. I even went without my bear mace (this bear/NJ thing requires a whole other post). I also purchased a fire blanket and extinguisher – in the words of boy scouts everywhere – be prepared. “So how did this happen?” you ask. Well last week was a bit rainy and it turns out small animals like to hide in the grill in inclement weather. Electric heats slowly with no flames so I’m fairly certain a gas grill would have had an animal scurrying instantly rather than thinking “wow isn’t the weather getting warmer – how nice” to themselves (safer for animals – clearly not). Note to self – check for small animals before heating your grill. Thank god I didn’t open it after it cooled last night, whilst my animal-loving friend was still here! But my point is, the exact same thing could have happened in a gas or charcoal grill – so I’m still not convinced electric is safer. Has this happened to you? Has anyone actually burnt down an apartment building using a grill of any description? 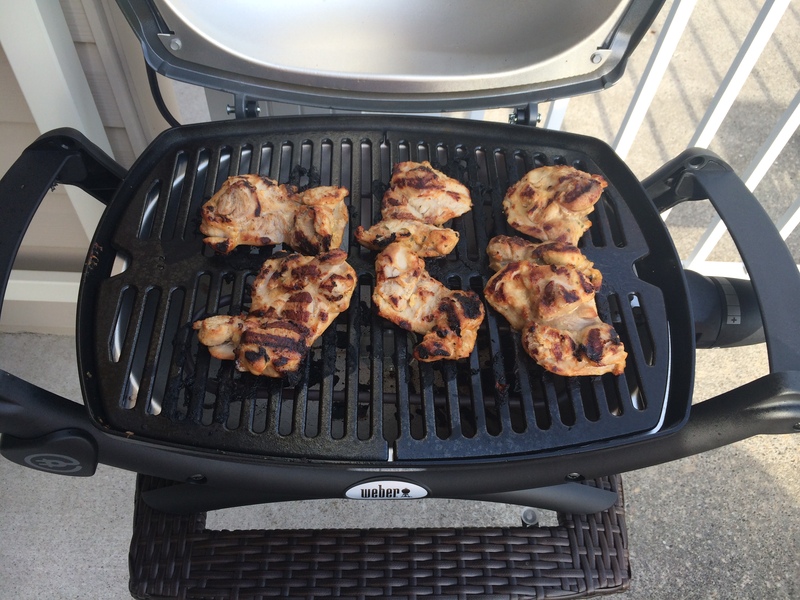 This entry was posted in Home Life and tagged bbq, outdoors, rules. Bookmark the permalink. 1 Response to Why do apartment buildings make you get an electric bbq?